Well, maybe a little less new since I’ve been running in them for about a month now, but they’re still very new and a VERY different style. Recently, I’ve noticed some running friends wearing a different shoe that looked intriguing to me. They’re on the larger side with a thick sole and large toe-box, and my friends RAVED about them. They were wearing Hokas. 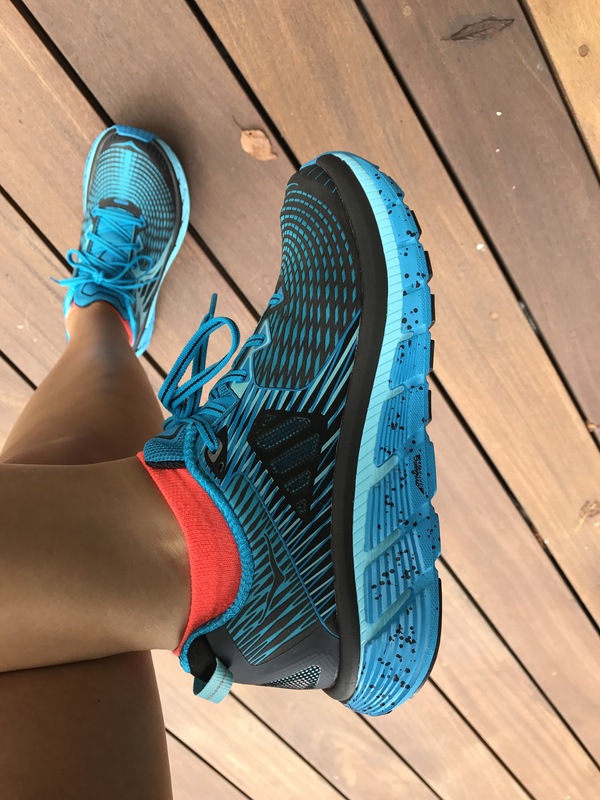 Hokas have extra cushioning, a ‘rocker’ that tilts your foot forward ever so slightly and promotes stability in the heel, all while being lightweight and sturdy. I decided I didn’t have anything to lose by trying them. 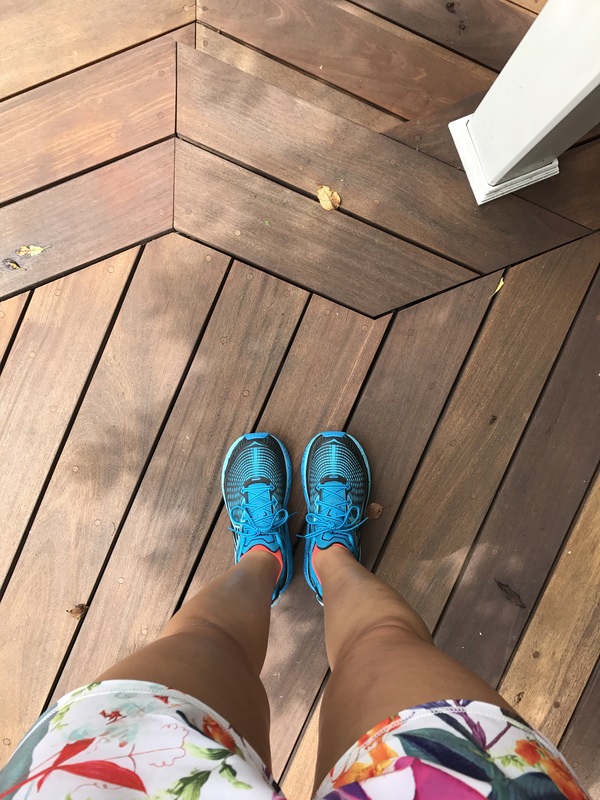 Instead of ordering online (like I do with shoes with which I’m already familiar), I decided trying them on and discussing with a running shoe professional would be worth the premium I’d pay at the store. Thankfully, our local running store was having their bi-annual sale and I was able to get a discount. I appreciated talking with the guy at the show store, who certainly knew more about Hokas than I did! I went with one of their highest greatest stability options, the Gaviota. 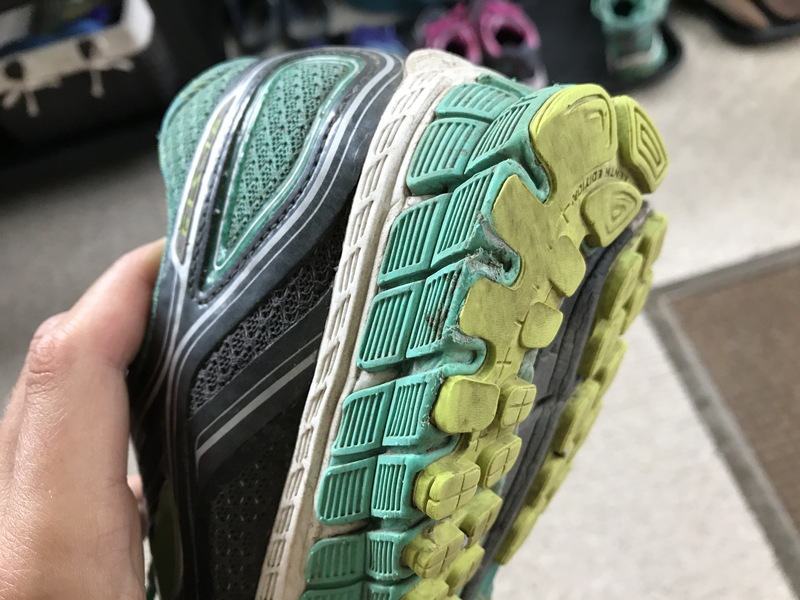 I also brought my current running shoes with me to the store (always a wise thing to do, especially for new runners), where the salesperson helping me directed my attention to the wear on the outer edge of the shoe. (See photo below.) I couldn’t believe how much I’d worn off in just a few months! I wasn’t surprised about the location; I’d recently noticed wear in the exact same spot on my Birkenstocks. I’ve been wearing the old ones on shorter runs, to keep my Hokas fresh for the marathon. The verdict: I love the Hokas! They really do feel different than my other shoes. I feel like I’m hitting the ground more with my forefoot than my heel, and I feel lighter and ‘bouncier’ than I did with the others. I’m glad I gave them a try! Posted on August 30, 2017 August 29, 2017 by thehealthypineapplePosted in i ♥ runningTagged brooks adrenaline, hoka gaviota, hoka one, Running, running shoes, saucony hurricane, stability running shoes. I love Hokas as well! I have been wearing the Clifton 1s for years (I bought a ton off of Ebay since they don’t make them anymore.) Sadly, I just had to retire my last pair and I am not loving the Clifton 3s at all. Actually had some blisters this morning after my 7 mile run. Are the Gaviotas light I wonder? I think i am going to have to go to a running store and try a few different styles. If I find my perfect shoe again I’m buying a bunch of them cause unfortunately the updates/newer versions are really different. Good luck with the rest of your training! Bummer about changes with the updates. I definitely noticed a difference in the Suacony Hurricane a few years back. Once the runners were retired and I started wearing the new ones, I realized how different they were. I think the Gaviotas are light, especially for a shoe with so much structure, and I think they make a lighter ‘racing’ version if you’re really concerned about weight. Thanks for the well wishes; having some really good long runs under my belt has me pumped for the race! Interesting, I’ve been running with the Saucony Hurricanes for about 3 years. This is the first I’ve heard of Hokas.